Are you a mother or mother-to-be? 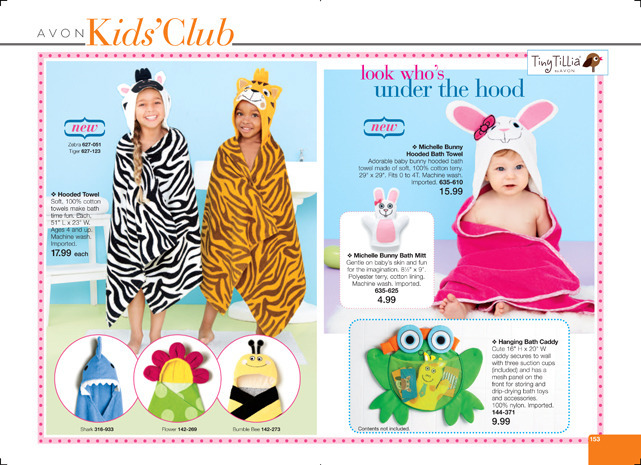 Avon and Tiny Tillia has adorable products for children, infants and mommy. Congratulations on motherhood and especially if you have a new baby on the way! I wanted to introduce you to Avon Products for children and the Tiny Tillia brand. My website offers Avon Products including bath & body products designed for children, fashion apparel in infant sizes 12 M to 7/6 toddler, toys for playtime, accessories, jewelry, and room decor. These products are backed by the leading global beauty company, Avon Products Inc. Many people enjoy the convenience of shopping at home, especially as they prepare for a new baby or during a busy time of year like the holidays. These baby & mommy products can be purchased directly through my website and will be shipped directly to your door! They often arrive within a few days of ordering. If you are from New Jersey’s Morris, Sussex or Passaic County areas, I’m currently booking demonstration parties. If you host an Open House at your home, you and your guests can see and experience first hand smart developmental toys, the inspired nursery decor, and the high quality products for bathtime. As the hostess, you can earn your products for FREE and your guests may win door prizes! Contact me for more details today! P.S. If you feel you are too busy for a home party, you could receive similar benefits by doing an online eParty or a Book Party. Contact me and ask about these options. Tiny Tillia Hanging Bath Caddy. Cute 16″ H x 20″ W caddy secures to wall with three suction cups (included) and has a mesh panel on the front for storing and drip-drying bath toys and accessories. 100% nylon. Imported. Item#: 144371. Price: $9.99. Contents not included. STYLISH GROMMET BAG $6.99 each, with a $25.00 Brochure purchase, details page 3. Currently shopping Campaign 5. Online until Tuesday 02/26/13 midnight EST. Avon Flyers: Outlet 5, C5-6 Countdown to Savings, C4-5 Glamour Spree. Meet Mark Magalog 2 products available only in C4 and C5, no backorders can be accepted. Kids Club & Tiny Tillia C5-6: Tiny Tillia Storybook 1 products available in Campaigns 5 and 6, no backorders can be accepted. Have you checked out the new Tiny Tillia Chloe Mouse products? They are so cute – I love the towel! FYI … Chloe is named after the niece of Tiffany Lerman, founder of Tiny Tillia. Bath buddies! Hooded Bath Towel. Reg. $16.00. Cute to the millionth power! These fluffy 29″ x 29″ hooded bath towels are made of soft, absorbent 100% cotton terry and feature the shiny, happy faces of favorite Tiny Tillia pals. Machine washable. Imported. SAVE 13%! Bath Bag. Reg. $15.00, Sale $12.99. Bath toys get a plush new home with these soft and sweet 9″ H x 7″ W x 4″ D bath bags. Nylon lining with mesh outer pocket for quicker drying. Incredibly soft and plush. Hook for easy hanging, and mesh pocket for drip-drying. Fully lined with water-resistant nylon. Polyester. Machine washable. Imported. Adopt them all! Bath Mitt. Reg. $5.00. Never a dull moment! Bring Tiny Tillia to life with these soft terry bath mitts – gentle on baby’s skin and great fun for the imagination. (Baby talk not included.) Machine washable. Imported. Shop Campaign 16 eBrochures online until on 07/31/12 by noon EST. mark. Magalog 8 products available only in C16 and C17, no backorders can be accepted. DIRECT DELIVERY Order Online! Did you know that shopping my website is safe and secure? And shipping is FREE with your first order, use code: REPFLYER. As well as FREE shipping with all $30 and above orders. For all other orders, standard shipping is only $3.00! Did you know I ship anywhere in the Contiguous United States? And in most cases, you can enjoy direct delivery right to your door within 3 days of ordering. An Easter Basket Soft Enough To Cuddle! Easter Chicks Make Bathtime Fun! Currently shopping Campaign 7 & mark. Magalog 3. PERSONAL DELIVERY orders due by Fri 03/23/12 if you are in the Morris County, NJ area. DIRECT DELIVERY orders due Mon 03/26/12 by noon EST for fast delivery directly to your door. mark. Magalog 3 products available only in C6 and C7, no backorders can be accepted.